At certain times of the year, for a couple of weeks in the spring and the fall, I need to be in two places at one time. I need to be feeding the animals because it is nearly sunset, and I need to be making dinner so my husband will have a hot meal when he gets home from work. I've developed a few strategies to deal with this time of year. One is to use my crockpot, and another is to make meals that I can prepare earlier in the day and pop in the oven when I go outside to feed, letting them cook while I'm working outside. Lasagna and macaroni-and-cheese would fall into this category, as well as oven-baked chicken. Oven-baked chicken is one of our favorite and easy chicken dishes. I use the recipe on the side of the yellow box of baking mix from the grocery store, even though I make my own baking mix now. Keep reading to learn how you can make it too. First, here's the chicken recipe. I boil the potatoes earlier in the day and make mashed potatoes when I come back in the house. Served with a green veggie, it's a delicious, easy meal that allows me time to do evening chores while it cooks. 1. Heat oven to 425°F. Melt butter in rectangular baking dish, 13x9x2 inches, in oven. 2. Stir together Bisquick®, paprika, salt and pepper; coat chicken. Place skin sides down in dish (dish and butter should be hot). 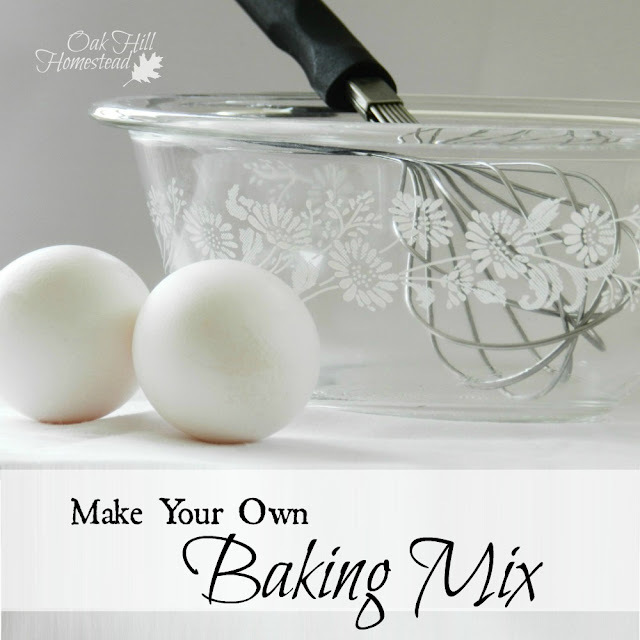 Making your own baking mix is quick and easy too. There are many recipes online; some include powdered milk, cream of tartar and other items. This one is basic and is the one that I use. By making it yourself you save money and skip all those additives that keep the brand name product shelf-stable. Combine the first four ingredients well in a large bowl. Using a pastry blender, cut in the shortening until the mixture resembles coarse meal. Store in well-sealed container in pantry or refrigerator. Your baking mix will last longer if you store it in the refrigerator. They sure do, Sandra, plus you know what's in them. Our family is allergic to onions so I make quite a few mixes. Not only are they cheaper to make but the quality is so much better. It is great to know that having them on your pantry shelf is a relief when unexpected things come up. Most of the work was done on a day that we had time, so that we can save that time later when our lives are more rushed. Mixes are a blessing, aren't they, Nana? My mom use to make up mixes from a book similar to that one. I copied the recipe thanks for sharing. Thanks for sharing. I'm going to write this one down. You're welcome, I'm glad it is helpful. That brings back memories! I have both Make a Mix Cookery and More Make a Mix!!! ( it has more specialized mixes) I haven’t used them in awhile, but really need to get them out and start making master mixes! How neat that you have both books! I know the first one is full of "gold" and I'm sure the other is too. I love homemade baking mixes a lot, thanks for sharing with hearth and soul blog hop. pinning and tweeting. Thank you, I'll come check it out. Did you know there is a second volume of the Make A Mix series? I think it is called More Make A Mix. You might find a copy of each of them on Amazon. Is this used in a recipe the same as a store bought baking mix? It isn't the exact same recipe as the big name brand, but I use it in the same recipes and the same amounts and can't tell the difference in the finished products. I've seen a variety of the baking mix recipes but haven't trusted any of them. But I'm glad to read the recipe from someone that really uses it. I've pinned it so I can give it a try sometime. Thank you! Thank you for your confidence, Dawn. I have used this recipe for years!